I had a bit of a play (and a bit of a read of the manual) and I was good to go. It’s so easy to understand and really easy to use and clean. Think about any food you would deep or shallow fry and you’ve got a good start for what you can cook. In a much healthier way. Because you’re using so much less oil, you are creating a much healthier meal when you’re using the AirChef compared to conventional frying. But you don’t need to stop there. We’ve reheated leftover baked potatoes in it (they come out amazingly crunchy), I’ve cooked homemade chicken nuggets, baked homemade fishcakes and made easy zucchini chippies (coat with a little wholemeal flour). Clean up is really simple too- and that’s coming from someone who never buys anything that can’t go in the dishwasher! If you want extra easy cleanup- line the bottom of the AirChef with baking paper or foil to ensure the majority of the mess can be easily removed. Mix together all of the ingredients and using a tablespoon, measure each fritter onto baking paper in the Air Chef, sprinkling with a tiny bit of olive oil. You can do three (or four if you line them up well) at once. Cook the first side for 10 minutes at 180. Then flip and cook the other side for a further 6-8 minutes. Mix the paprika, flour and polenta together and put into a bowl. Wet the cauliflower and then coat well in the flour mix. Cover the bottom of the Air Chef air frying oven with baking paper. Add as many florets as you can (one layer only) and spray lightly with olive oil cook for 15 minutes at 200 degrees. Turn halfway through. Mix all the ingredients together and rolls teaspoons full of the mixture into little balls. Airfy at 200 degrees for 15 minutes in a single layer on baking paper, rolling over hallway through. Kylie is a mum and kids food blogger. She enjoys encouraging her family and readers to eat healthier food through the use of whole foods and homemade alternatives to processed and takeout foods. 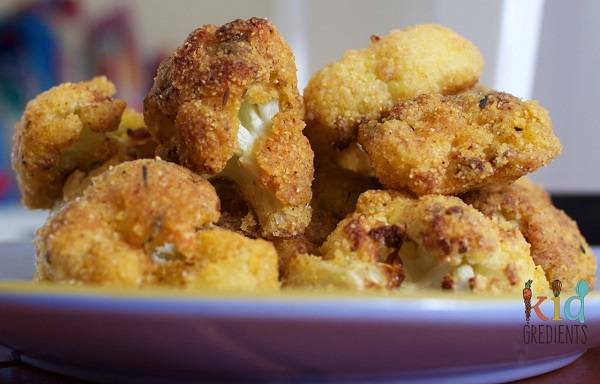 I think I want an air fryer now, the cauli popcorn looks amazing.